When the Los Angeles Rams travel to New Orleans on Sunday to take on the Saints it will be the first time in NFL history that two teams averaging at least 33 points per game met in Week 9 or later. The game is also poised to be a historic one inside sportsbooks across the country, as it could feature the highest point total for an NFL game in 15 years. 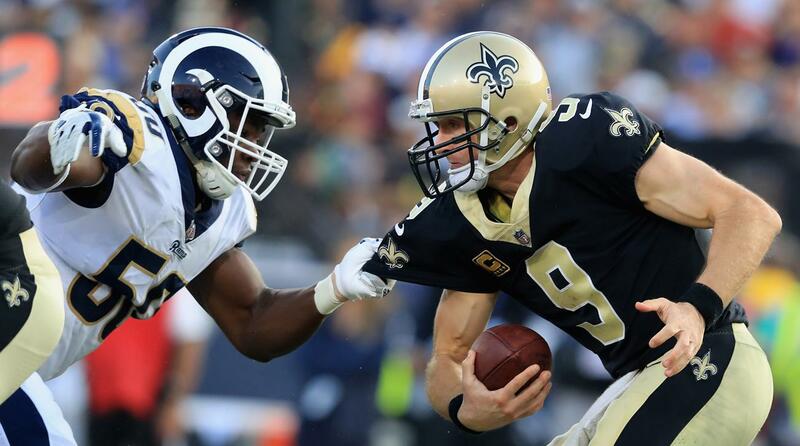 The 8-0 Rams enter the game with the league’s third highest scoring offense, averaging 33 points per game, while the 6-1 Saints have the league’s second highest scoring offense, averaging 33.4 points per game. As of Thursday, the Westgate Las Vegas had the over/under for the showdown between the two NFC powerhouses set at 60 points. If the number stays at or above 60 when it the line closes it will mark the highest point total in an NFL game since Christmas Day 2004 and will tie for the second highest total ever, according to Pro Football Reference. The Oakland Raiders traveled to take on the Kansas City Chiefs on December 25, 2004 for a Week 16 with an over/under that closed at an even 60 points. The Chiefs won that game 31-30 with a field goal in the final minute that pushed the game over the total. 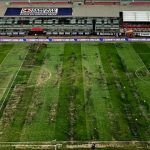 In 2000, the Rams, with the “Greatest Show on Turf,” played in a game which featured the highest ever total, closing at 63 points. They defeated the 49ers 34-24 in a game that stayed under the massive projected number. Since then, the closest a game has come to reaching a 60-point total was earlier this year on October 14 when the New England Patriots played host to the Kansas City Chiefs in a game that closed at 59.5. That estimate proved to be far too conservative – the two teams engaged in a back and forth shootout that ended in a 43-40 Patriot victory. The highest listed total in Rams games this season came last week against the Green Bay Packers in a game that closed at 57 points. 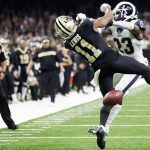 The Rams won 29-27 to stay just under the total, but it was what happened late that sent shockwaves through the sports betting world. Rams’ star running back Todd Gurley purposely got tackled inbounds late in the fourth quarter of the game, forgoing an easy walk-in touchdown in exchange for running out the final minute of the game. Not only did Gurley’s move save Packer backers who bet Green Bay +7.5, it also prevented the over from hitting; which, despite the Rams’ high-powered offense, is just 3-5 in the team’s eight games so far. The Saints have played in twice in games that closed with an over/under of 54, the highest total of their games so far. The first was a 43-37 win in Atlanta that went over and the other was a 30-20 win in Minnesota on Sunday that stayed under. 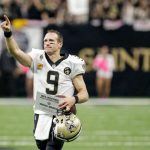 Like the Rams, the Saints boast an explosive offense but haven’t been a great team for over bettors this season. The over is just 3-4 throughout the team’s first seven games.